It’s common in many industries for a company to be named after its partners. The names both individually and as part of the firm name develop goodwill, which makes it a challenge when an individual departs – how do you divvy it up? Not how it was done in Basile Baumann Prost Cole & Assocs., Inc. v. BBP & Assocs. LLC. 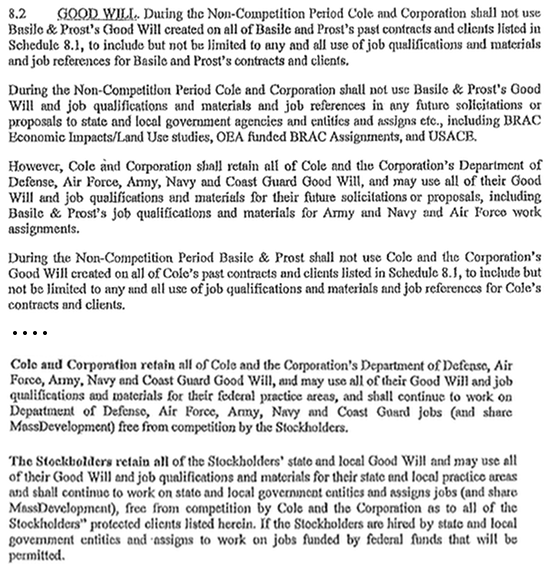 If you can’t read it, it says “[a]ll goodwill created on all past contracts and clients by Basile and Prost [within the last four years] to include but not be limited to any and all use of job qualifications and materials and job references for Basile and Prost’s contracts and clients.” The corporation retained all assets not assigned, which included the “Basile Baumann Prost Cole & Associates” name. Before moving on to the decision, can we talk about how awful this concept is? What on earth does “goodwill” mean here? It appears that the parties were trying to define how they could refer to work done during the relationship. Undoubtedly how the two companies distinguish their businesses while still taking credit for their previous work is going to be the trickiest area for the two companies to navigate in the future. But leaving this difficult task to the undefined and ambiguous term “goodwill” – a term that those of us who work with it every day are still challenged to define – almost guaranteed a lawsuit. Ultimately Basile Baumann Prost Cole & Associates sued BBP & Associates for trademark infringement, cybersquatting, false advertising and related state law claims. Both parties filed motions for summary judgment and indeed what “goodwill” means was one of the sticking points. Goodwill is “the total of all the imponderable qualities that attract customers to [a] business.” “There may be business or professional goodwill, or both combined in one enterprise.” Professional, or personal goodwill, “is good will that is based on the personal attributes of the individual such as personal skill, training, or reputation.” In Maryland, the concept of personal goodwill most often arises in cases involving the distribution of property in divorce, or covenants not to compete. The Stock Redemption Agreement is unambiguous in at least one respect: it was not a sale of the Corporation’s entire business and goodwill. Although Basile and Prost acquired certain assets—including 83 jobs, 138 leads and proposals, and the “goodwill [they] created on [certain] past contracts and clients”—the Corporation retained all other assets, including the company name and location, two-thirds of the staff, and 70 percent of the Corporation’s contracts by revenue. Thus, the agreement was not a “sale of a business and … its good will” that impliedly transferred the Corporation’s trademarks. Basile and Prost also argued that Basile Baumann Prost Cole & Associates had abandoned the mark “BBPA” but they did not meet their burden of proof for summary judgment. They also failed to prove, on summary judgment, that there was no likelihood of confusion. But it wasn’t so one-sided that Basile Baumann Prost Cole & Associates proved that there was confusion, and summary judgment in its favor was denied also. This is what happens when you don’t have trademark lawyers working M&A. Basile Baumann Prost Cole & Assocs., Inc. v. BBP & Assocs. LLC, Civ. No. WDQ-11-2478 (D. Md. June 19, 2012).